I have been obsessed lately with Jenny Nicholson’s video on Pandora- The World of Avatar at Disney World’s Animal Kingdom. Also she drops a Hunchback reference, so if you haven’t seen that video, go see it. I have seen it multiple times and it’s and it’s like an hour long and I have no attention span. In Jenny’s video she talks about the history of Animal Kingdom and how there was supposed to a medieval fantasy section called Beastly Kingdom as the concept of the park was explore animals of the present, past and myth but they ran out of money and went for the Dinosaur part. Long story short, after Disney lost out on Harry Potter to Universal, the management of Disney went for another cultural significant movie franchise experience that was insanely immersive, so they went with Avatar, not the Airbender one, the Dances with Wolves in space. Unlike Harry Potter or Star Wars, the buzz and staying power of Avatar haven’t held up over time so it’s odd that Disney just went for this concept but the land looks really cool and does speak to the fantasy element and conservation angle. But it also of speaks to Disney’s influencing power. It maybe a generalization but kids haven’t seen the movie, it was rated PG-13, came out nearly a decade ago and is really only good in an imax setting but Disney went for it and kids can now adopt Banshee puppets for $65 dollars a pop, $90 if you include the perch. FYI I think the Banshee puppets are cute. It really fascinates me that Disney pushed so hard on this project and yet a lot of their own properties get ignored within the parks, like Hunchback. So I have been on a slight deep drive into Disney parks, learning what I can about them, mostly via Youtube videos since I have no plans as right now to go to any of the parks. First let’s talk about the Characters, the Face characters, though I guess Frollo and Quasimodo are not technically Face Characters but all I mean is characters that you meet. The Question is can you even see/meet/greet any of Hunchback Characters at any of the Disney parks worldwide? According to Fill my Passport, you can but not a Disney Land or Disney World. This information is a bit old as it’s from 2017. According to Fill my Passport Quasimodo makes extremely rare appearance at Disneyland Paris. 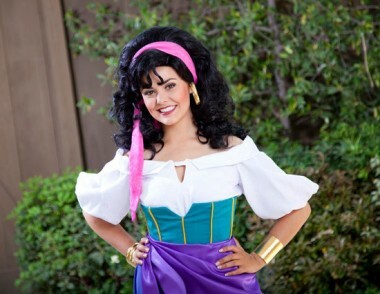 Esmeralda can often see at Tokyo Disney and once in a while at Disneyland Paris. Frollo can be see at Halloween at Tokyo Disney. He used at appear at Disney USA parks during Halloween but not so much now. Clopin can be see at Disneyland Paris. And Phoebus doesn’t show up anymore. Fill my Passport as talks about other rare Disney characters in the Disney park so do check out that blog. However videos from a year ago show a rare meet and greet with Esmeralda and Clopin. It seemed to have occurred at DVC Moonlight Magic Special Event during after hours in the Magic Kingdom, in early 2018. Here is a meet and greet with Phoebus from 3 years ago at the France pavilion at Epcot. Hunchback characters meet and greets seem to be extremely rare these days so if you see a hunchback character walking around try to see them, if you like that experience. Hope you won’t mind that I posted this comment under the “Esmeralda “category, but comments are closed for the 2014 “lost films” page, which is how I discovered your site. It’s very thorough and fascinating. He’s owned a print for years, and recently Chicago Film Archive transferred it the film to DVD so he could accompany it. That’s amazing. Thank you for sharing.